For her first exhibition at Hauser & Wirth Zürich, Bharti Kher unveils a new ensemble of sculptures that have been growing in her studio over the last few years. In line with earlier studio practice, Kher assembles, juxtaposes and transforms found objects that are witness to their own histories. Wooden wheels and architectural remnants, mannequin body casts and pillars all clash in mis-en-scene of dystopia and grand orchestration. These elements are assembled in a hazardous manner; suspended from the ceiling, hanging from ropes, propped up and held from falling with the help of counterweights and balances. Within the gallery, the objects are dramatically illuminated by a ray of light emitted from a searchlight usually used to navigate at sea. Together, the light and objects create a volume within the space – defining it, intersecting it and using all its dimensions like a curvature or ribbon that links all things. The overall impression of this architectural intervention is chaos; uniquely dependant on each object as a marker for the next, the viewer becomes witness to an un-definable domestic narrative; an event past or about to happen. The only stability in the ensemble is a triangle, the work that gives the exhibition its title, in which a single point of contact holds everything together in perfect equilibrium. 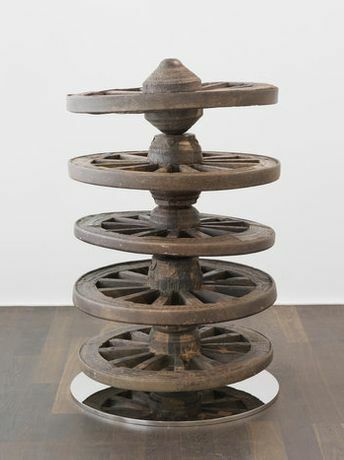 The works on display at Hauser & Wirth are individual works, but in this exhibition they form a heterogeneous narrative in which Kher further explores the artistic strategy of stripping objects of their meaning and making them open to misinterpretation and magic, creating alluring works of abstract beauty. Kher has exhibited at numerous museums and institutions internationally, including the Rockbund Art Museum, Shanghai, China (2014); Parasol unit foundation for contemporary art, London (2012); the Art Gallery of Alberta, Edmonton, Canada (2012); the Museum of Contemporary Art, Tokyo (2010); the Essl Museum, Klosterneuburg, Austria (2009); the Baltic Centre for Contemporary Art, Gateshead, UK (2008); the South African National Gallery, Cape Town, South Africa (2007); and the Yale University Art Gallery, New Haven, CT (2006), among others. Kher was awarded the YFLO Woman Achiever of the Year in 2007 and received the ARKEN prize in 2010. Bharti Kher lives and works in New Delhi.